In my snarky-teen attempt to warn movie-goers that they were not in fact getting real butter on their popcorn, I would ask, "Would you like artificially-flavored buttered topping on that?" Most people ignored me and added the oily substance to their popcorn anyway. Some people laughed... and added the oily substance to their popcorn anyway. In other words, no one wanted to see what was behind that curtain, especially not from a kid. Your movie theater butter has no butter in it, but it does have partially hydrogenated soybean oil (a.k.a. trans fats), beta carotene (a coloring, makes carrots orange), tertiary Butylhydroquinone or TBHQ (synthetic preservative that keeps the color and texture from changing as the product sits), polydimethylsiloxane (silicone based chemical that prevents foaming), and, wait for it, buttery flavoring. They do not say what exactly makes a buttery flavoring, but they do admit that it isn’t butter. So it is some sort of chemical that mimics butter. And the part that is most egregious to me? 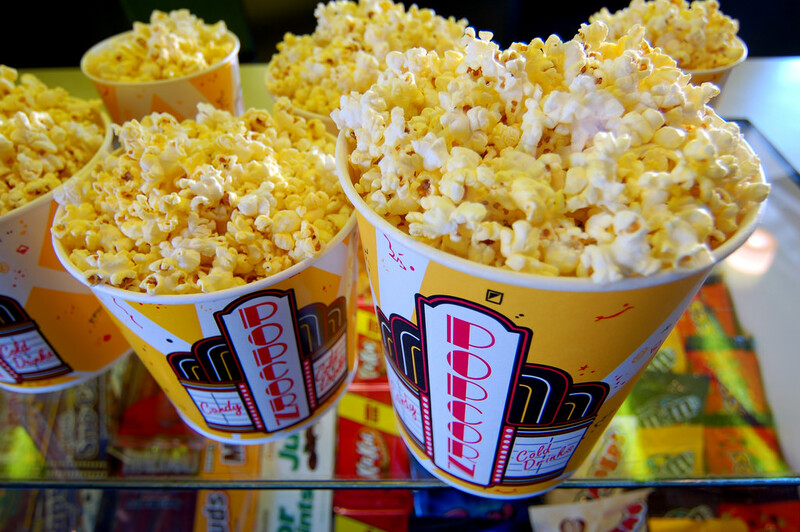 Movie theater butter topping actually has 20 more calories per tablespoon than real butter. Forget the whole trans fat, bad cholesterol, chemically laden, artificially flavored part, it is also 20 percent more caloric? That's adding insult to injury. Especially since a large bucket contains a minimum of three tablespoons, and as much as six if you have them do the butter on half of the corn before filling up and more butter on top. That could also take your large corn into the over 2000-calorie realm. Up from the about 1000 calories for a plain. Double. In just fat and chemicals. Entire article here: What Is in Movie Theater Popcorn Butter?